If you use your bike to commute, a good bicycle lock is absolutely indispensable. There are many subpar, cheap bicycle locks on the market that are more for show than anything else. Using one of these shabby locks will result in your bike being targeted by thieves, and will cost you a lot more money in the long run than simply buying a good lock in the first place. 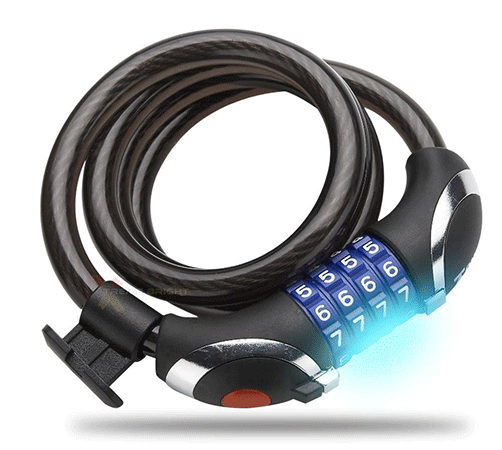 A high-quality bicycle lock should be tough enough to withstand the typical tools used by thieves. It should also be lightweight enough that you can carry it from place to place on your bike or in a bag. It should be easy to use without much fuss, and lastly it should be durable enough to withstand the test of time. The three main types of bicycle locks are chains, U-locks and cables. Each type has its virtues. 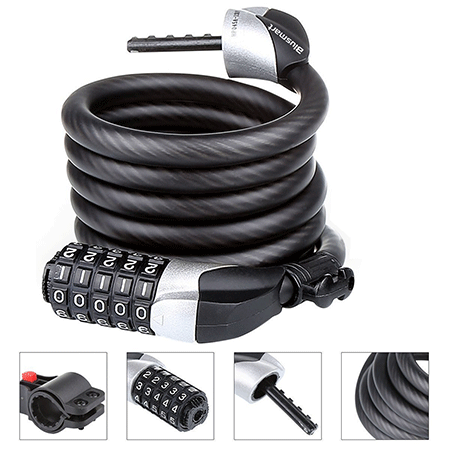 This bicycle lock is a simple cable design with a combination lock. The lock can be set to any 4 numbers you choose. It’s lightweight and thin, and includes a holder for attachment to your bike while you ride. This lock comes in 4 colors and is 6 feet long. This lock is ideal for casual rides, for low-crime areas, or to lock up a removable bike part like a wheel. 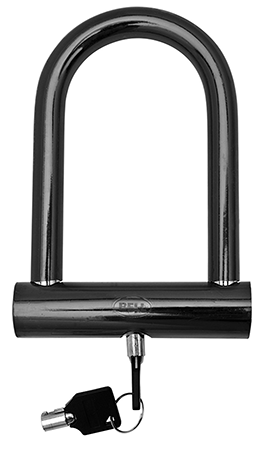 This simple U-lock is made from hardened steel. It has a dual bolt locking system, meaning that each end of the U-lock locks into place. It comes in a few different designs, from the 200 version to the 750 model, depending on your security needs. Models 500 and up come with a steel cable as well for added protection. The smallest version of this lock is relatively lightweight for a U-lock. This is a basic, low-cost lock that is appropriate for low- or medium-crime areas. 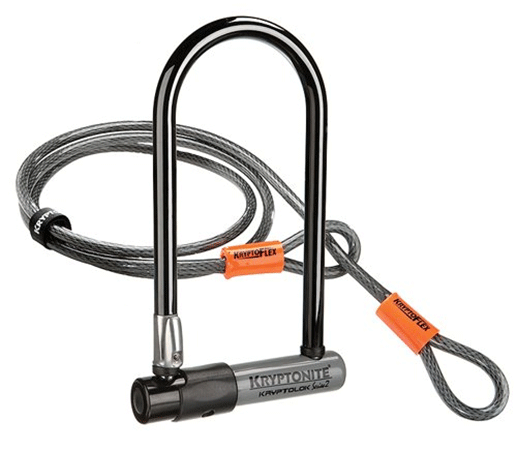 This bike lock from Kryptonite comes in 4 colors and is 32 inches long. It’s made of 7mm-thick chain links with a cylinder lock. 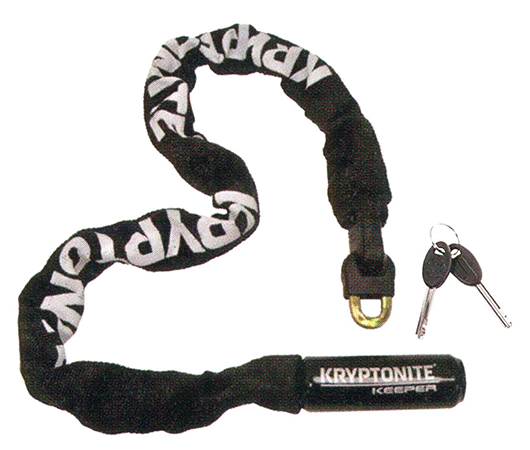 This lock is made of hardened steel, and is recommended by Kryptonite for use in low-crime areas. The chain is covered in cloth and is sturdy and a good medium length. The Sigtuna Gear bike lock is an all-in-one solution that includes a U-lock, steel cable, and mounting bracket all in one package. 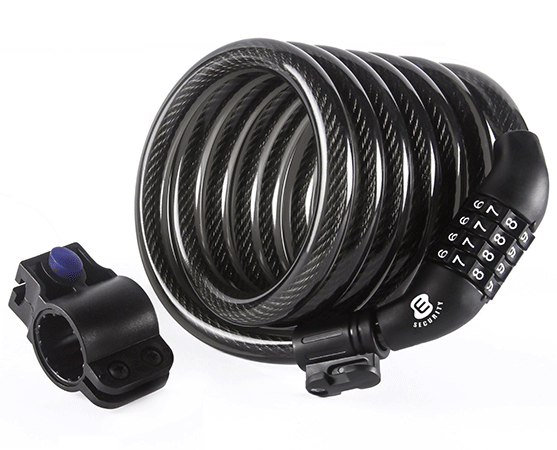 The U-lock is double-bolted and made of hardened steel, while the cable is made from braided flex steel cable. The U-lock is lightweight at just 2.5 pounds. This unique and affordable bike cable made by Xtreme bright is made with an LED light that illuminates the combination lock, allowing you to more easily access your bike in the dark. It’s made from woven steel and is water-resistant. You can set a custom 4-number combination for the lock. Like most cable locks, this one is suitable for low-crime areas or for locking up a removable wheel. The Etronic cable lock is extremely affordable and is a good value for the money. It allows you to set your own combination and reset as necessary. The cable is made from braided steel with a vinyl coating for durability. It’s 6 feet long, so it has plenty of length. It also includes a mounting bracket. This lock is one of the cheapest you can buy. It’s made of flexible steel cables with a vinyl coating to protect the metal. 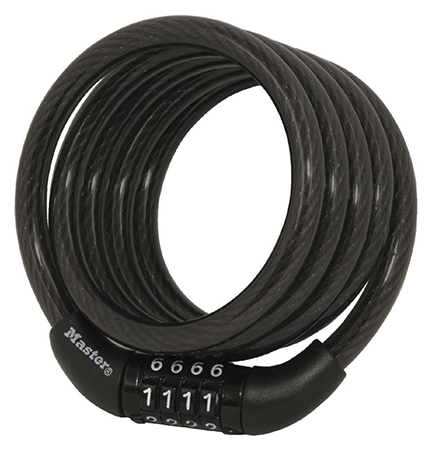 The 4-number combination lock is pre-set, meaning you can’t customize the combination to your own set of numbers. The lock is 4 feet long. This lock is only appropriate for low-crime areas. 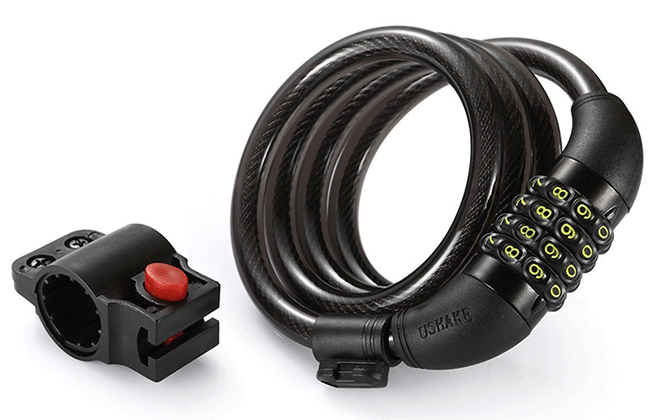 The Kryptolok Series 2 is a U-lock with a flex cable. The U-lock is made from 13mm thick steel. A mounting bracket also comes included. There is a rotating key cover to prevent water damage in the keyhole. 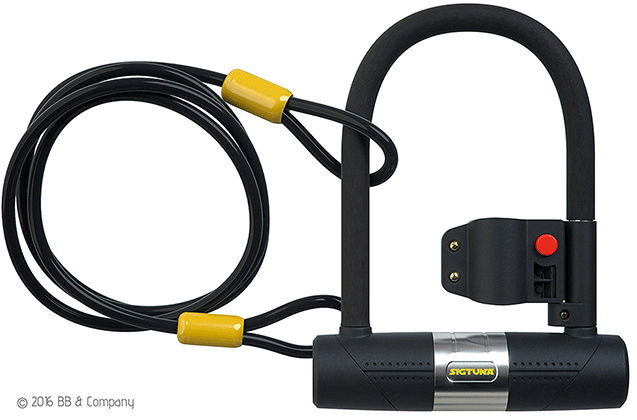 The U-lock and cable together weigh only 3.6 pounds, which is relatively lightweight. This lock is great for medium-crime areas. 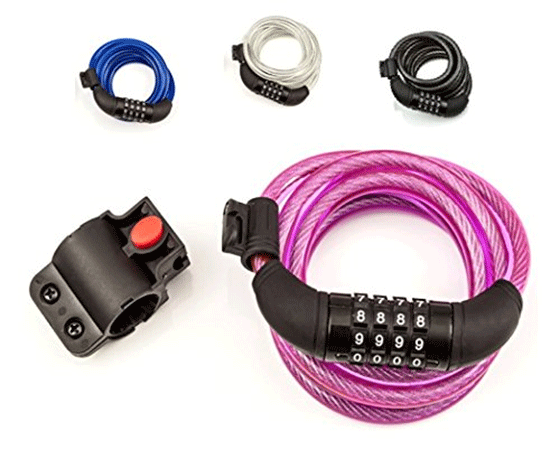 The Blusmart cable lock is extremely popular due to its durable construction and low price. It’s made from twisted metal wrapped in a rubber coating. You can set the 5-digit lock to your own personalized combination. The cable is 6 feet long. It also comes with a mount for easily carrying the lock on your bicycle. This lock is enough to deter opportunistic thieves. This cable lock from UShake is a basic cable lock, made from flexible steel with a PVC coating to prevent scratching and protect the metal. The 4-digit combination can be set to any number you choose and is easy to set up. The cable is 4 feet long, which is a nice medium size. This lock weighs just 0.7 pounds — you can’t get much more lightweight than that! Using a chain, U-lock or cable is a matter of individual preference. If you leave your bike out overnight, you’ll likely want something heavy-duty, while quick trips to the store usually warrant a lightweight lock only. Make your decision carefully and keep your bike as safe as possible. These 10 bicycle locks are all great values.